Last Man to Die takes you on a cross-art journey to the future, melding theatre, music and visual art in a showdown between artists to find new life - even if they have to cheat, steal, calculate, reanimate, and not pull punches to get there. Vital LMTD questions what it means to live and what it means to die. What it means to stare oblivion in the face, and to steal oblivion's last macaroon. But who will be the last one left alive? 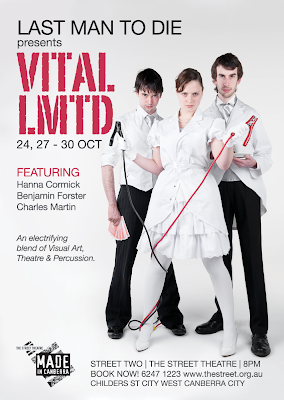 Following our packed out preview at Newcastle's Crack Theatre Festival, Vital LMTD is coming to The Street Theatre in Canberra! Presented at: Street 2 (The Street Theatre), Childers St, Canberra.